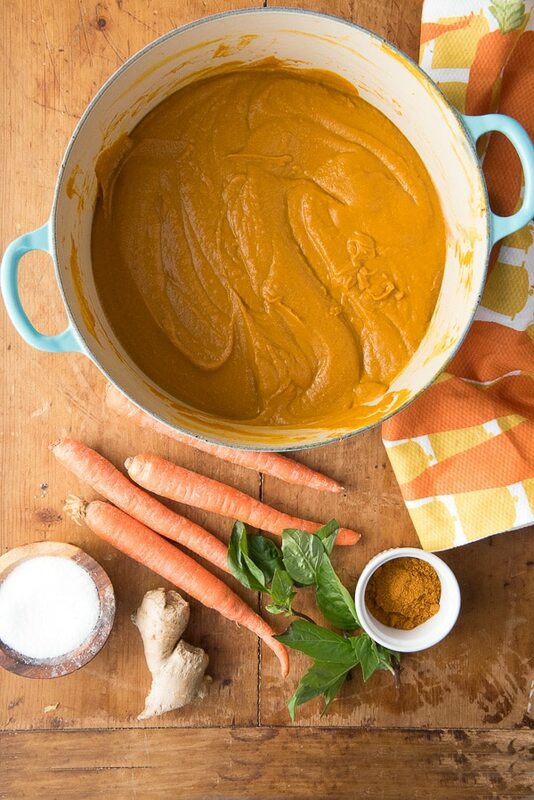 Simple ingredients blend together to make a thick, luscious Curried Roasted Carrot Ginger soup. Spicy and warming, it’s the perfect soup for any chilly day! This delicious recipe sponsored by White Wave Foods. All opinions are my own. It’s mid-January; how are those New Year’s resolutions going? I learned a long time ago that creating longer term realistic goals is a much better path to success for me than ‘lose 10 pounds by February 1′ or ‘go to the gym every single day’. I just can’t stick with aggressive goals that are unrealistic no matter how badly I want the end result. This year I really want to work on creating more plant-friendly recipes that are out of my box. I want to incorporate them into our family dining plans in a way that takes less thinking. I can be a creature of habit and my go-to recipes when I’m not feeling inspired are often the same. Stretching my recipe repertoire to include plant-based proteins too is a key goal. We eat almost all organically and prioritize organic ingredients when shopping. I have learned where to find the best organic options (not just for produce) and at the best prices. Ultimately, I want the best quality AND the best price, don’t you? AND I don’t want to go to multiple stores if I can avoid it. I simply don’t have the time. One of my sure bet stores in King Soopers (our local Kroger brand store). They carry organic ingredients with their Simple Truth brand but they also have a dedicated Natural Foods Department. Being gluten-free it’s my first stop for all the fundamentals we use. I also know I can find quality bulk ingredients and staples I need (for instance the vegetable broth and olive oil I used in today’s recipe were there). You know that experience when you go to a new grocery store and it’s like landing on a different planet? Nothing is in the same place as other stores? What I love about the Kroger/King Soopers Natural Foods Department is that it is clearly identified with dark hardwood flooring, different shelving than the rest of the store that feels like shopping at a cozy neighborhood market. It makes it easy when visiting new Kroger stores to know where to find what I want. Thanks to a recent big snow storm I was inspired to make a hearty soup. The kind that takes the chill out of that day. I decided to make a Curried Roasted Carrot Ginger Soup that is vegan. If you aren’t vegan that word might scare you. Maybe you think you won’t like it. Maybe you think it won’t taste good. Maybe you think it won’t be filling enough if it is only plants! A trick I learned a long time ago is that big flavor goes a long way to make food satisfying. 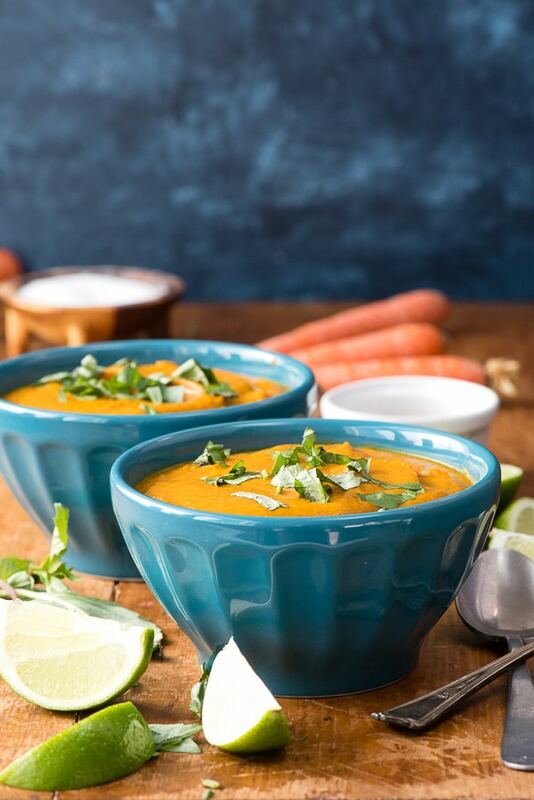 This Curried Roasted Carrot Ginger Soup is thick and filling with a creamy texture. The curry and ginger make for a spicy, bold flavor palette, one that is warming too. It’s a fantastic way to get more vegetables into your diet (anyone have that on their New Year’s resolution list?!). And who can resist this color?! 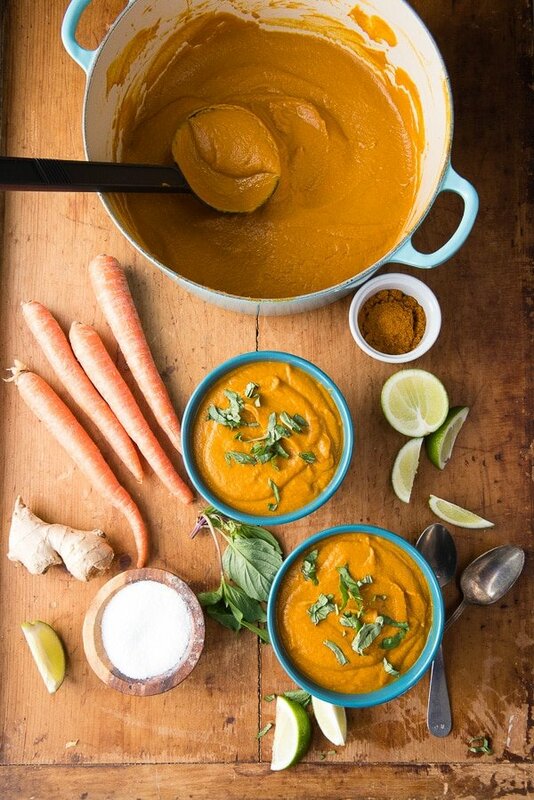 This spicy, warming Curried Roasted Carrot Ginger soup recipe is a winter favorite. You’d never guess this thick comforting soup is also dairy-free and vegan too (as well as gluten-free). 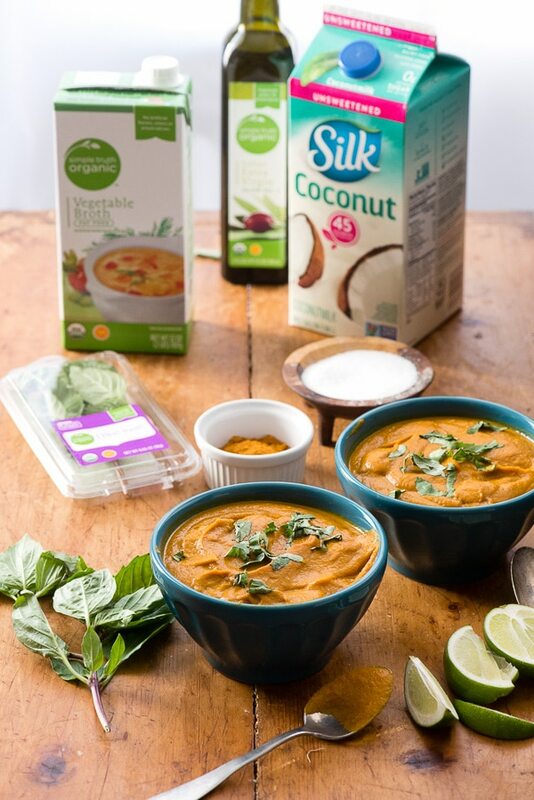 You'd never guess this thick, creamy, full-bodied soup is vegan and dairy-free unless you peeked at the ingredients. The sweet-spicy flavors from the carrots and ginger create an exciting and satisfying soup. Preheat the oven to 375 degrees. Line a large baking sheet with sides with foil, dull side up (or a baking pan may be substituted and no foil is required). Spray with non-stick cooking spray. Place the carrots, garlic cloves in skin and onion quarters on the baking sheet. Drizzle with 1 tablespoon of the olive oil and toss with your hands to coat. Place in the oven to cook for 1 hour, flipping the vegetables halfway through. A few minutes before the vegetables are done roasting, add the remaining tablespoon of oil to a heavy Dutch oven or stock pot with a lid over medium heat. When hot add the curry powder and ginger to the oil and stir together to make a paste. Allow to cook and become fragrant for 2 minutes. Add the vegetable broth and whisk to combine. Add the roasted carrots and onions to the pot with the curry mixture. Slice the end of the garlic cloves and squeeze the inside into the pot. Bring to a low boil, put the lid on the pot and allow to boil for 20-30 minutes until the carrots are soft. Remove from the heat. Stir in the coconut milk and salt. Using an immersion blender or processing batches through a blender or food processor, pulverize the vegetables into a smooth, thick soup. Serve with sliced of Thai basil (regular fresh basil may be substituted) and wedges of lime to give a squeeze into the soup before eating. Wow this looks amazing. I am very into making my own soups lately so I would like to try this out. Especially since it has ginger in it I am obsessed with ginger lately. It’s so good for us too, ginger! Before I make this I actually need to buy some curry spice. I have never cooked with it and am not even sure of its flavor profile! 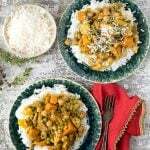 Curry is something that is uniquely blended in different ways in many different cultures. Luckily you can but generic curry powder in the spice department of any supermarket and this is the blend used in this recipe. It’s an earthy, warm, blend of corriander, cumin, turmeric, ginger, mustard, cinnamon, chilies and more. I’ve never had this soup before but it sounds really yummy! Ginger is really great at clearing throats too, especially this winter when I get itchy throats all the time! 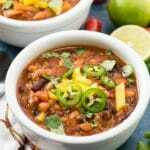 As a vegetarian this recipe is music to my tastebuds! And I love that it has curry to give it that extra kick! 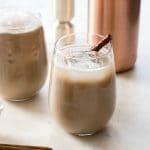 Your pics continually wow me and make me want to try every recipe you share! Thank you Melissa! You could not pay me a higher compliment. I hope you’ll love the soup! This soup would work wonders for my husband’s pain. He has chronic pain in his lower back because of some stenosis in his spine. I have read that turmeric and ginger have very good pain relieving properties and are also anti-inflammatory. I love that this soup is both delicious and healing as well. This looks like an interesting soup – I have never heard of it before. Your pictures are so vivid! yum. this looks so good. all of the flavors look like the mix really well. I have been super into making homemade soup lately and this one i can’t wait to try. 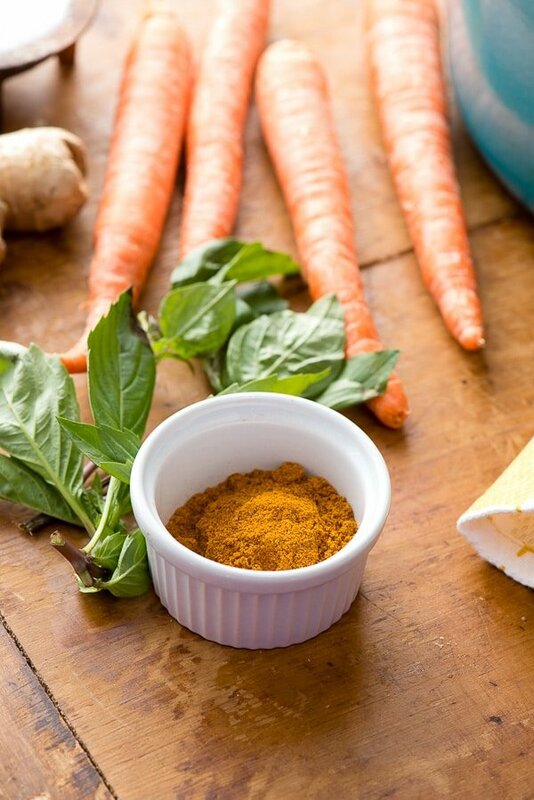 I love curry and i love ginger so i know this will be a hit in this house…yum! This looks soooo good. It would be great on a cold night, with a blanket, and a nice glass of wine. The flavor combination looks and sounds amazing. YUM! This sounds absolutely delicious! I love a good soup recipe and adore curry! I love gingered carrots, but never thought about soup like this! This time of year has me wanting soup every day. This is the perfect time of the year to make soup. 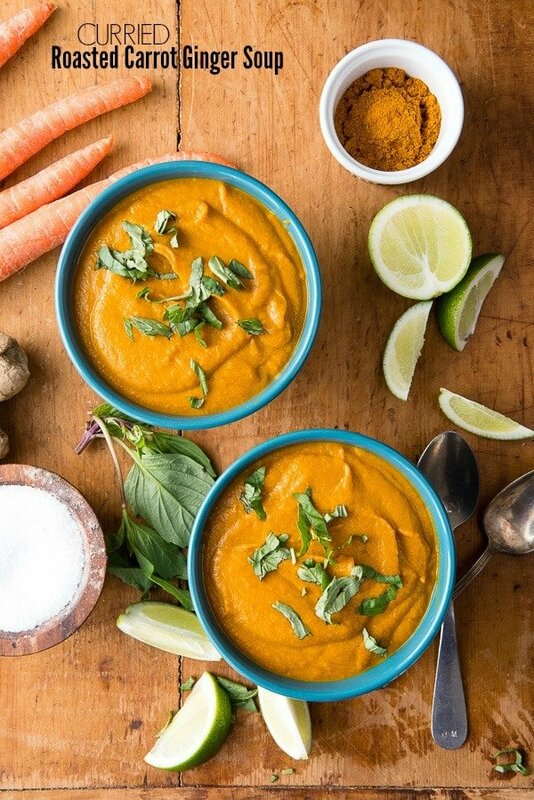 This curried roasted carrot ginger soup looks so delicious and easy to make. I will have to give this recipe a try on the weekend. This looks delicious. I bet it’s great when you are feeling sick. I think this soup looks so tasty! I love pureed soups with some nice crusty bread. I will have to make this, this winter. That looks so delicious! I have never tried carrot soup so I’ll have to give your recipe a shot! Great job! I am a huge soup lover and yours looks amazing! Thanks for sharing the recipe! Me too Jonna! So glad you like it! Many of my favorite flavors all in one. I love the Simple Truth Organic brand at Kroger! My daughter loves curried pumpkin ginger soup. Pumpkin is hard to find when its not the holidays though so I bet she would really enjoy this. I don’t know why pumpkin isn’t available outside of the fall holidays but this definitely would be a close option! 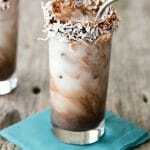 I certainly must try this recipe! I love soups for lunch and dinner meals during the cold winter months (I love carrot and ginger too)! I eat them for every meal of the day! What an interesting soup idea to create. 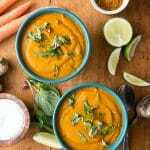 I love the mix of carrot and ginger, most certainly will give this recipe for soup a try on a cold winter day! Curry is one of my favorite flavors. I’ll have to cook up some of this. This is the first time I’ve ever heard of carrot soup. This is a suit I know my husband would absolutely love. He loves anything with curry and his favorite vegetable is carrots. I will definitely have to try the soup out for him. This sounds amazing! I am making this for the family this weekend! I’ve actually never heard of carrot soup before. It looks really good, though. I love the addition of the curry.